Each week this season, we'll break down a player, trend or scheme from the Eagles' previous game using the coaches' all-22 film. This week, we spotlight the offense's NFL-leading red zone production. The Eagles have converted 28 of 39 (71.8 percent) red zone possessions into touchdowns this season. Over the last 19 seasons, only eight teams have finished the season with a rate of 70 percent or higher. The Eagles break down their offensive preparation to essentially three areas: base downs (first and second), third down and red zone, and split game planning among coach Doug Pederson, offensive coordinator Frank Reich, quarterbacks coach John DeFilippo and wide receivers coach Mike Groh. Pederson: Frank and myself do the base. Frank, myself and Mike Groh will spend time on third down. Then Frank, myself and DeFilippo will attack the red zone. The Eagles have a playbook so vast that it may be months before a certain play with a certain formation is called on game day. It took until the eighth game for Pederson to dial up a red zone play with "23" personnel (two running backs and two tight ends), but this play was clearly in the game plan to take advantage of a 49ers linebackers group that had experienced turnover during the season. With two running backs, San Francisco was likely thinking "run." But Corey Clement (No. 30) motioned into the slot and Wendell Smallwood (No. 28) ran to the flat after the snap. The 49ers failed to account for Zach Ertz (86), though, and when they blitzed, the tight end sneaked into the back for an easy touchdown. Ertz: The coaches do a great job of putting us in situations to be successful. … All we have to do is run the route and we know the ball is going to be exactly where it is. Pederson: I think it's one of the things that I credit the offensive coaches for is maximizing our personnel down there, creating some matchups. Take, for instance, this touchdown run against the Broncos. The Eagles had many plays throughout the game to take advantage of the aggressiveness of linebacker Von Miller (58) and leave him unblocked. On this first-and-goal read-option play, the Eagles lined up in the pistol on the right hash. 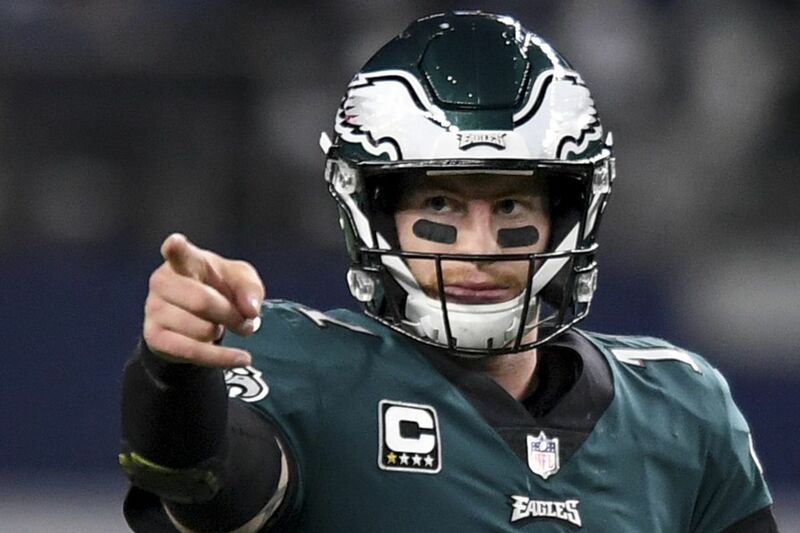 Quarterback Carson Wentz (No. 11) is the mismatch because once he takes the snap and runs at Miller, the linebacker doesn't know if he's going to the keep it, dish to Clement, or maybe even throw a pass. He had already been victimized by a run-pass option play that went for a touchdown throw earlier in the game. Miller crashed down on Wentz, who simply pitched to his wing man for an easy six points. Wentz: The biggest thing is the game plan we have coming in each week. Our coaches do a tremendous job of getting guys in the right positions to make plays. Our balance of being able to run the ball down there and throw the ball has been big for us, too. Of the Eagles' 28 red zone touchdowns, only eight have been on the ground, but each has been different. On Clement's second score against the Broncos, the Eagles used a "tackle over" alignment to give a run-heavy look to the left. But in this circumstance, they ran away from that side. The Eagles' three main practice days are divided among base downs (first and second) on Wednesdays, third down on Thursday and red zone on Friday. Pederson: I can remember back when I was a player in Green Bay under Mike Holmgren, we actually did a little bit of red zone on a Thursday, and I actually do that now. I … finish the day with three plays. The Eagles clearly spent a lot of time on their "tackle pull" run play before facing the Cowboys. It wasn't just for the red zone, but it worked to perfection on this Clement 11-yard touchdown. Pederson: I think for us, it's just the continuity of continuing to rep and to execute the same concepts over and over each week. The Eagles only recently started working on the following play, according to Alshon Jeffery. He has increasingly lined up in the slot, and here, Pederson got him opposite a linebacker with a safety over top. Wentz's pump to Ertz held the safety, and once Jeffery (No. 17) cleared the linebacker, a perfect lob was placed high for the leaping receiver. Pederson can do only so much game planning throughout the week, but he makes the final call on which plays make the cut and which ones are called on game day. He has had the magic touch. On this third down against the Panthers, Pederson called a play that got Ertz matched up against a cornerback in the middle. A shallow crossing route by Brent Celek (87) cleared the throwing lane, and Wentz threw a strike through the window. The Eagles didn't have Ertz against the Broncos, but that didn't stop Pederson from calling plays designed to go to his tight ends. He has often said that the Eagles see the red zone as extending to the 30. This call came on the 27-yard line, so it didn't technically count toward red zone numbers, but it was an end zone play. Pederson found another mismatch, this time in "12" personnel (one running back and two tight ends). Trey Burton (88) split wide vs. a linebacker, a matchup the Eagles would love, especially on a vertical route. Burton ran a slant and go double move, and Wentz lofted a pass with a perfect touch. Wentz often has the luxury of checking to another play based on his pre-snap reads. He has become a seasoned pro. Pederson: You get a lot of information pre-snap on any down, but particularly in the red zone when things become a little tighter, a little faster, lanes are a little narrow, or the ball has to be out a little faster. Wentz: The tighter you get to the red zone, the defense has to declare their coverage a little more. In the back of our heads, we have those things we can go to versus different looks. Sometimes you have to change things, and sometime you just let it roll. On this play Sunday against the Bears, Wentz let it roll against single-high man defense. He trusted that Ertz would beat his man – safety Adrian Amos (38) – on a fake corner, skinny-post route because they had already hooked up on that route countless times. But Wentz needed to use his eyes to move the free safety (39) off Ertz and the linebacker underneath to clear the throwing lane. Ertz turned Amos around, and Wentz flawlessly executed his part. Ertz: Carson did a great job with his eyes, kind of holding the safety back-side. And I just was able to beat my guy one on one. Later that game, Wentz and Nelson Agholor (13) hooked up for another red zone score. Three of Agholor's six touchdowns this season have come outside the 20, but he's the Eagles' best receiver in space and best option short of the goal line. On this run-pass option play, Wentz must make his read post-snap. His pre-snap Spidey sense, though, must have told him to keep an eye on the slot corner in case he blitzed. Wentz didn't even fake a handoff to Clement for an inside zone run because the ball was out so quick to Agholor on a bubble screen. Agholor had tons of room to beat the first defender to the outside and used his athleticism to somersault into the end zone. Wentz's 117.9 red zone passer rating is third-best in the NFL. He has completed 30 of 46 passes with 20 touchdowns and no interceptions or sacks. When a play isn't the best vs. a certain defense or there are equal or better players on the opposite side, you just sometimes need your players to make plays. On this fourth down against the Cowboys, Jeffery ran a skinny post out of the slot vs. man defense. With two safeties over top, as well, Wentz's pass would have to be perfect. It was, but even that wasn't enough as Jeffery had to make a stupendous catch in traffic. Jeffery has six red zone catches for five touchdowns, but Ertz leads the Eagles with 10 red zone catches for seven touchdowns. This catch against the Panthers says it all. Pederson: Zach right now is extremely, extremely hot down there.